While C-SPAN might not have revived representative democracy, it has left the door open for that revival. In 1979, a young representative just starting his second term kicked off the day in the House of Representatives by talking about television. After congratulating his colleagues on the decision to open the House to television cameras, Rep. Al Gore made a prediction: "Television will change this institution, Mr. Speaker, just as it has changed the executive branch. But the good will far outweigh the bad." It could even, he suggested, "revive representative democracy." As a believer in the revolutionary potential of technology — a belief that also made him an early booster of the internet — Al Gore was the ideal politician to greet the arrival of C-SPAN, 40 years ago this March. And while it seems like fewer and fewer people today see the rise of his pet technologies, cable TV and the internet, as pillars of a healthy democracy, the development of C-SPAN suggests that the most damaging aspects of our current media environment were not technological inevitabilities, but rather the result of political and economic choices. The development of C-SPAN suggests that the most damaging aspects of our current media environment were not technological inevitabilities, but rather the result of political and economic choices. The Cable-Satellite Public Affairs Network launched in March of 1979, as Americans were still coming to terms with the shocking revelations of the decade. News of government secrecy — lies about the Vietnam War, the Watergate cover-up and its aftermath, revelations of decades of secret CIA plots and experiments — shattered trust in the federal government. That experience left Americans hungry for both transparency and oversight. C-SPAN promised both. Carrying the proceedings of the House of Representatives as they happened, C-SPAN offered Americans an unfiltered, unmediated peek into their government. It was in many ways the opposite of what would be offered on both the nightly network news and the 24-hour cable news. The latter of which arrived in 1980 with the launch of CNN. 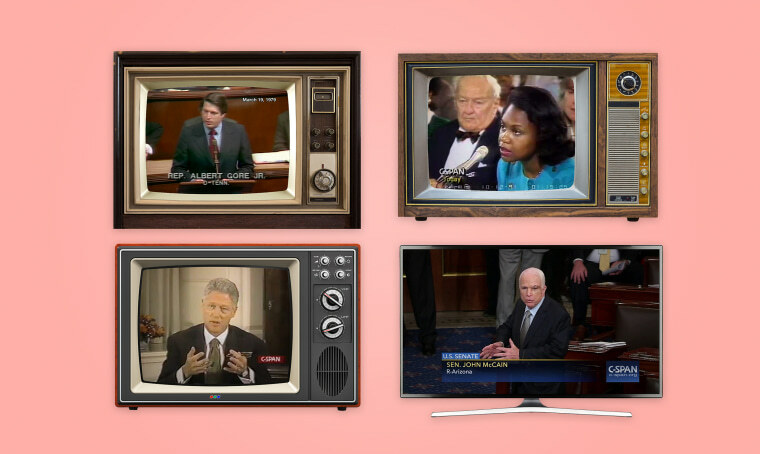 Tightly packaged, smartly produced, ratings-driven programming was the norm for other outlets — not C-SPAN. And while that might sound like a backhanded compliment, the network was meeting a real hunger for information untouched by a strong editorial hand. But despite occasional efforts to manipulate the camera stream, the channel provided a much-needed public service: bringing the daily activities of the legislative branch into the homes of the American people, allowing voters to see their government in action as a form of education and oversight. It served legislators, too, allowing them more direct contact with constituents who could see them at work. The channel provided a much-needed public service: bringing the daily activities of the legislative branch into the homes of the American people. What C-SPAN ultimately is, besides a public service, is an argument about how best to deliver information about government. It has added to its coverage of the House and Senate other public affairs programming, including call-in shows and interview segments where viewers pose questions and explain their perspectives, panels from think tanks and academic conferences and long-form interviews with public figures. Touted by Lamb as "anti-commercial television," the programming that came to supplement the congressional floor feed was deliberative, trustworthy, and — for the first time on national television — interactive. In many ways, the network was ahead of its time: reality television and wall-to-wall political coverage in an era before either of those had become staples of the media landscape. Yet while, in an attempt to gin up ratings, reality television has increasingly shed its devotion to reality and cable news has shed its devotion to news, C-SPAN has remained, if not exactly the same, grounded by its commitment to a continuous set of principles. In the process, it has provided a window into, and a record of, some of the most significant political moments of the last 40 years: Sen. Ted Kennedy's fiery denunciation of Robert Bork's Supreme Court nomination, the months-long debates over Bill Clinton's impeachment and the surprise resignation of speaker of the House Bob Livingston — the Republican spearheading impeachment hearings who was caught in his own extramarital affair. The question that lingers — that has been there for all 40 years of C-SPAN's existence — is whether unfiltered reality and deliberative debate is what the American people want. These days the American political scene is much more a product of Fox News and CNN than C-SPAN, and there are no ratings figures for C-SPAN to determine if it attracts more eyeballs than, say, MSNBC. (We can assume it does not.) But that, too, is part of C-SPAN's argument: that there is an audience for their kind of news, news that is shaped by a sense of public interest rather than advertisers' demands. So was Al Gore right? Has televised coverage of Congress improved the legislative branch? Given Congress's dismal poll numbers, the answer is probably not. But it has improved American political culture, ensuring Americans can see their government at work while creating an archive of what has transpired in Congress, available for historians hoping to understand the dramatic changes in our political and media landscape. And while C-SPAN might not have revived representative democracy, as Gore hoped it might, it has left the door open for that revival. Nicole Hemmer is a visiting scholar at the Brian Lamb School of Communication at Purdue University and an assistant professor at University of Virginia's Miller Center.